On Friday, April 20th, the participants in Ms President US learned how to detect whether news is true or fake, and how to stay safe online. 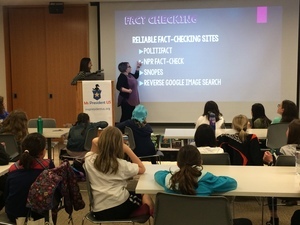 Led by Brenda McKinley, the Ridgefield Library Director, and library staff, the girls were given examples of various images and news stories, and then challenged to figure out which ones were real and which were altered. The girls were also warned about social media use: "Did you know that all of the content you share on Facebook is no longer your private property, and that deleting it doesn't make it go away?" asked Kristina Lareau, Head of the Children's Department. 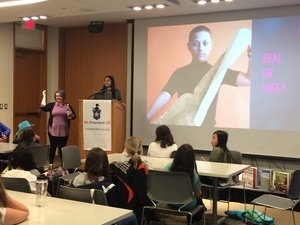 Ms Lareau cautioned the girls not to post an image to a social media site that they don't want to show up in their lives many years later, particularly if they plan to run for office. 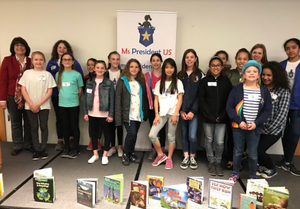 Erica Gauquier, Teen Services Librarian, provided the girls with resources that can be used to help their campaign, including books about many topics of interest to the candidates. Issues the candidates plan to address include: gun control, mental health reform, environmental protection, gender equality, and social media misuse. All are welcome to attend the Election and vote for the first Ms President US by coming to The Ridgefield Playhouse on Sunday, May 6th, from 3:00 to 5:00 pm. The event is free, but donations are encouraged.